The name Coco Di Mama, meaning “a mother’s love” in Italian, fittingly describes the care taken in the creation of this 1.1 acre enclave. From the beautifully landscaped grounds shaded by mature native trees and handsome garden pergola, to the clean modern interiors, the quality and attention to detail of this property becomes apparent. Recently completed, the 3 bedroom, 3 bath, 2,000 square foot home features thermal windows and doors, high-efficiency air conditioning and appliances, granite countertops, and innovative cabinet designs. Two bedrooms with en-suite baths flank the open plan living area, kitchen, and dining area, and each room has large windows and doors that open onto the porch and the Sea of Abaco views. The third bedroom and bath is accessed separately off of the main entry, offering an additional level of privacy for guests. Paved walkways, and lush green lawns lined with native coral stone connect the lower level laundry and workshop to the outdoor garden areas and lead down to the 80 foot dock. With 6 feet of water depth at low tide, the dock offers space for multiple boats and plenty of room for installation of a boat lift. A detached garage houses the 20KW standby generator, and offers room for golf cart parking and storage. 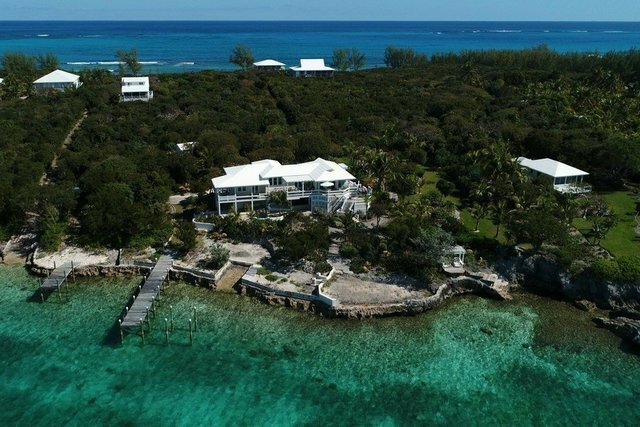 This modern island home is set on 250 feet of water frontage amidst the limestone cliffs of the south end of Great Guana Cay. These cliffs are one of the few remaining nesting areas for the once-endangered Atlantic tropic bird. From the home and the surrounding 1,865 square foot of decks and porches, you can watch these small white birds feeding just offshore over the turquoise colors of the Sea of Abaco. Pristine sandy beaches on the Atlantic side of the island are just a short walk from the house, and the vibrant out-island settlement is just a 5 minute golf cart ride away. The settlement offers the convenience of four dining options, a grocery store, marina and fuel facilities, plus dive shops and boat rentals. The central hub of Abaco, Marsh Harbour, is accessible by multiple daily ferry runs and is only a 20-minute boat ride away. The international airport is serviced by multiple daily flights available through major carriers and regional airlines from Miami, Palm Beach, Orlando and Atlanta.